The Krowne 21-309L hot stem assembly has a red marker on the top to let users know hot water will be turned on when they use this handle. This piece of equipment is a quarter-turn ceramic cartridge, which turns smoothly. 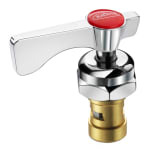 It is designed to be used on a wall or deck mount faucet, and most brands are compatible with the Krowne 21-309L hot stem assembly.